Yes, indeed, that is an 11 pound chicken! Absolutely awesome, pasture-raised, organic chickens! Our chickens are raised on green grass and clover flowers in our mobile chicken tractors. We move them to fresh pasture twice a day to ensure they're happy and healthy. They're given free choice, organic, all-grain feed. They have fresh air and clean water at all times. They live well and die with respect. Click here to reserve your chickens! We choose to grow birds that are slower growing than the industry standard, super-fast-maturing breeds. We make this choice because our birds are more mobile, have better feather coverage, are more resilient to heat and cold, and do not have the heart, leg, and beak deformities common among standard, fast-maturing meat breeds. They take a little longer to mature, which means they cost a bit more to raise, but these birds are healthy, and happy. Healthy food comes from healthy animals. Did I mention they're tender and juicy, and plump and meaty? Oh man, they're so delicious! 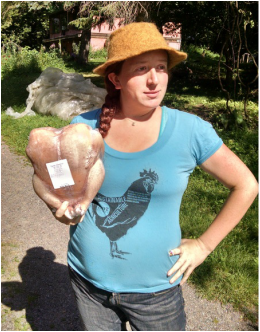 We sell our chickens through a hybrid CSA model. Folks pay $10.00 up front for each chicken they'd like to reserve, and then pay the balance upon pick up. The reservation fee helps us cover our upfront costs, such as purchasing the birds, as well as feed and butchering costs. We sell our chickens for $4.50-$5 a pound (depending on which batch it is!). So, for example, say you reserve one chicken and it happens to be 5 pounds, so you pay $10 up front. That means $5 x 5lbs = $25 - $10(deposit) = $15 on pick up day! Folks must be able to make arrangements to pick up their birds from the farm on the date selected! Please submit a registration form here, and then make your deposit--either with cash or check via mail/farm visit or using a credit card via our online store. Please note the online price is $2 more per bird to cover our electronic processing fees. And unfortunately the fee cannot contribute toward the balance remaining on pick-up day. 2018 Harvest dates: TBD in June and July So why reserve your birds now? Because we have to buy them now so that they'll be the proper size and maturity by our harvest dates. Knowing how many chickens folks are interested in significantly assists us in our planning, and your reservation fees directly contribute to helping us pay for high quality feed.